Would you rather pay $400 when you can get the job done with a few more clicks? New feature in software X has been in open source software Y for years. David vs Goliath stories are sure as hell interesting, and GIMP has been clawing at Photoshop’s ankles for years. Mind you, I am not condescending, a free software that can actually threaten a multi-million dollar program like Photoshop is not only doing well but is also setting an example. I myself have used GIMP for the past five years. Notably because Photoshop wouldn’t run on my old Intel Pentium M machine. Nonetheless, GIMP manages simple photo manipulation quite well. Quite well, however, is not good enough when it comes to a professional environment. For me, only one thing was a game changer— Photoshop knew what I wanted to do. Gimp didn’t. The GIMP interface is awfully confusing for a beginner. Too many buttons, too many windows and too many things hidden. Yes, there are adjustments and plugins to make it look like Photoshop but why do I need to do that? GIMP awfully feels as if it is different for the sake of being different. As to why GIMP falls short even with the simplest task, a picture can speak a thousand words. Here are the results of stroking a font in PS and in Illustrator. There might be a way to recreate Photoshop’s stroke effect in GIMP but that would take me at least ten minutes of googling. Efficiency matters. 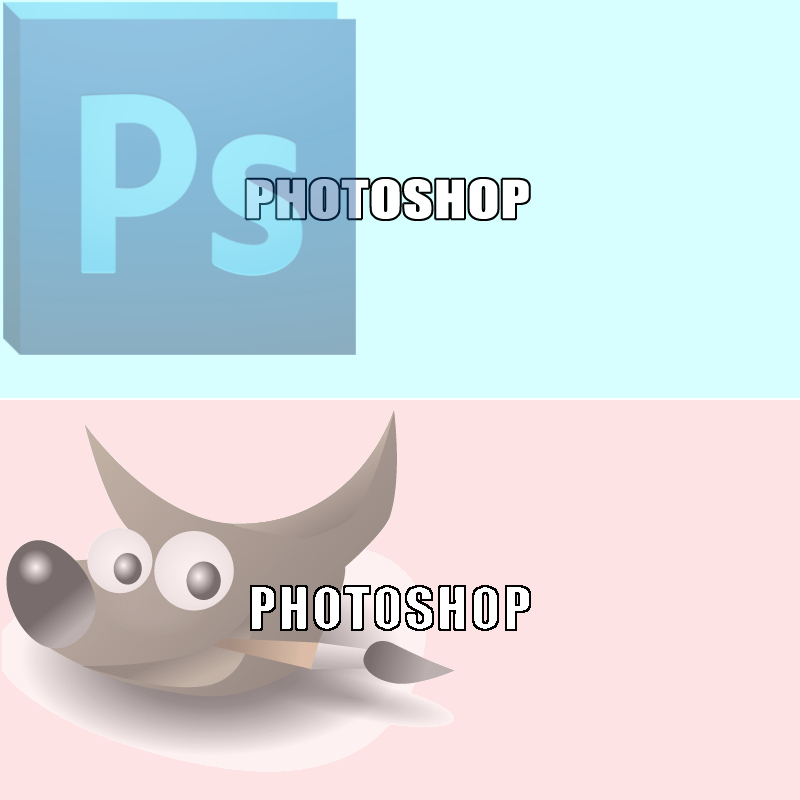 That pretty much sums up the entire Photoshop vs GIMP competition. You get what you pay for, in GIMP’s case you get more than what you pay for. My Inkscape vs Illustrator journey wasn’t even much of a journey. I installed Inkscape and it looked dreadful. Deciding to weather the storm and master it nonetheless, I still got stuck. It was more my fault than the community’s but here was another game-changer – the community tutorials. I know Inkscape hasn’t been around for long but a community that declares itself a competitor without even getting past the 0.999.999.999.9.1 (build 99832 Alpha 3 RC 98) stage surely speaks loads. Most of the Inkscape tuts I came across were cutesy stuff or semi-professional. And the only book available was horribly boring. As for Adobe Illustrator, I was bombarded with hundreds of tutorials all around. Delivering content is another huge deal. If looks didn’t matter, everything would be plain b/w and the world wouldn’t have so many single people. Inkscape interface looks and feels horrible compared to Adobe Illustrator’s. It would be better if they weren’t trying so hard to be different from Illustrator. The similar interfaces would encourage migration as well. It took me a month to learn Adobe Illustrator against a month of trying to motivate myself to learn Inkscape. I wasn’t the only one, three members of my web staff had the same problem with Inkscape. They were making vectorized teacups and they hated it. We live in a time where we deem it necessary to shave a few seconds off our boot times. When a delusional part of the Open Source community screams that their free product is better, it might cause more harm than good. The open source community should stick to winning formulas and introduce changes only when the masses need it. Remember, kids; being a hipster might feel good but it won’t pay the bills. Rumman R Kalam aka TehGoatLord is a goat with opposable thumbs. When he isn't busy chewing grass he's found writing on Bangladesh's only humour website Rantages.com because only his own website can cater to his erratic writing habits. Would You Apply For A Job Through Facebook?